The PDS-811 and PDS-821 programmable device servers (PDS) are compact, modular, intelligent, rugged, and are designed for networking RS-232 and RS-422/485 serial devices to an Ethernet network. The PDS-811 has one I/O expansion slot, while PDS-821 has two I/O expansion slots that can be used to attach various 2- or 4-port serial communication modules. Therefore, a maximum of 4 serial ports can be installed on the PDS-811 or a maximum of 8 serial ports can be installed on the PDS-821. Note: There is no serial module built-in to the PDS-811 or PDS-821 by default. 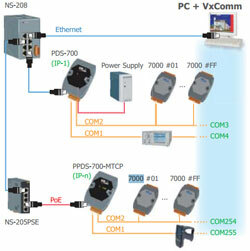 The PDS-811 and PDS-821 controllers are equipped with a 2-port 10/100 Base-TX Ethernet Switch that can be used to connect two network segments. The Ethernet Switch processes and routes data on the data-link layer (layer 2) of the OSI model to create a different collision domain per switch port. Using a switch allows you to attain dedicated bandwidth on point-to-point connections with every computer, and therefore run in full duplex mode with no collisions. Furthermore, the built-in 2-port Ethernet Switch on the PDS-811/821 enables network wiring to be simplified by cascading your Ethernet devices. The PDS-8x1 series contains a built-in operating system, the MiniOS7, which offers a stable and high performance environment that is similar to DOS. The MiniOS7 can boot up the PDS-8x1 series within just one second, with the added benefit of no virus problems and a small footprint. Furthermore, the PDS-8x1 series is designed for low power consumption, maintenance elimination (no hard disk and no fan), and is constructed from fire retardant materials (UL94-V0 level) with a robust case.